In the last two weeks, I’ve made dozens of pickles. My favorite sweet pickles were first on the list, and if you have been reading along, or had a quick lunch over here in MrsW’s kitchen, you know I serve these all year long. This is a pickle that’s worth the (very minimal) work. They are sweet and briny with a sharp vinegar bite. Without a doubt, the best part is the crispness. They are the perfect deviled egg, egg salad, tuna salad or chicken salad pickle. They pair with rich salty charcuterie in a wonderful way. And they are perfect for that refrigerator contemplation… the “what’s for dinner” stare … that requires something lifted aimlessly from jar to mouth while thinking. Slicing the cucumbers is the only real work, made easy with the mandoline. There’s no real recipe, only a technique. And for the last twenty years, I’ve been acting as if this recipe is my very own secret. The recipe was on a card in the metal file box my grandmother used for her recipes, titled Luvey’s Seven Day Pickles. In the time I’ve been blogging, so much has been made of originality and recipe attribution. So, calling these pickles Luvey’s seemed the correct attribution for what I was sure was original and unique. Until I walked through Union Square Greenmarket last month, wandering aimlessly, glancing at table after table of lovely foods. There was a farmer with a table filled with jars. One jar said Seven Day Pickles. I picked it up, turned it this way and that, and knew, just knew, that any claim of originality was going to be pushed aside. As soon as the boiling water goes in, the color begins to change. What incredible arrogance to think that this was a secret recipe! I’m really quite embarrassed. As if the Greenmarket experience wasn’t enough to make me rethink, Emily Nunn came to visit (she’s making her Comfort Food Tour, but you’ll have to ask her about that.) Emily and I met virtually through Food52, and I just knew I would love her. Her recipe for Lemon Blueberry Pancakes is amazing (secret ingredient!) and the Matilda, Maple, & Garlic Pork Shoulder with Crispy Skin – the title alone makes my mouth water. She arrived for a visit a bit remorseful, saying she had intended to bring some of her Aunt’s special sweet pickles. My ears perked up with that mention. Somehow I knew, I just knew. Yes, Aunt Mariah makes the same seven day pickle. After one day, there’s a lot of bubbling and foaming. Emily claims Mariah’s have more clove, but I surmise that is just a matter of pickling spice, and now that I’ve seen the recipe, my suspicions have been confirmed. There are a couple of slight adjustments to the technique, but really, it’s just about the same darn pickle. So, they’re not original…but they are amazing. Like no other pickle. And in these dog days of summer, when the heat is hovering at 100°F every single day, here’s a preserving recipe that has very little cooking involved. Day Two. Not very interesting. It’s simple, and the ingredients are few, but there is one you may not know. Alum is what makes this pickle crisp. It’s a mineral – an old time mineral used to maintain crispness. It’s not creepy. It’s not a first cousin to high fructose corn syrup or neighbor to those multisyllabic scary ingredients. It’s found in some grocery spice aisles. I’ve done some research and encourage you to do more if you want. It’s not a bad thing, alum. It’s natural and serves a mineral, simple purpose adding snap to these pickles. There is no processing and these jars are shelf stable. Really. If you process these pickles, you will cook them and they won’t be the same. I’ve kept them on my shelf for a year (they never last any longer than that, and having enough for a year is always a challenge.) The high concentration of both sugar and vinegar certainly adds to the stability. Still, I make one recipe, 12 pints, intending to consume them or give them away within one year. Make these with the firmest cucumbers you can find. I know you will say ten pounds? Geez, that’s a lot of pickles. Go ahead, halve the recipe if you must, but I’ll bet you will regret not having more pickles once you’ve tasted one of these seven day wonders. 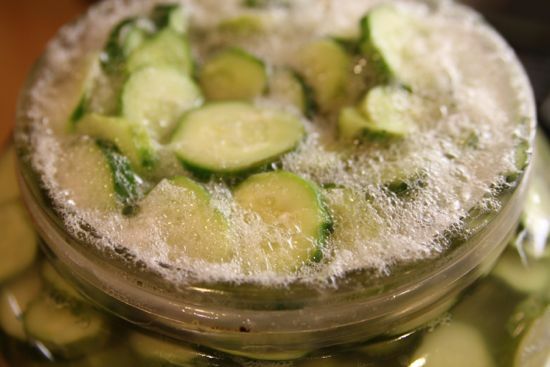 Soak the cucumbers in ice cold water for 30 minutes. Pack the slices into a huge jar or food safe container. Cover with boiling water. Cover the container and let it sit overnight. Drain. Add the salt to one gallon of boiling water. Pour the boiling water over the cucumber slices. Drain. Add the alum to one gallon of boiling water. Pour the water/alum mixture over the cucumber slices. Put the pickling spice into a cheesecloth bundle (or a tea ball!) and add to the cider vinegar. Pour the vinegar mixture over the cucumber slices. Cover and let it sit for three days. Drain, reserving 2 cups of the vinegar. Dispose of the pickling spices. Put the pickles into a giant bowl. Pour the sugar over the pickles, stir well and allow the mixture to sit for about an hour. The sugar will draw the liquid out of the pickles and make a syrup, some of which is now on the bottom of the bowl. Scrape/pour the syrup over the pickles, dividing evenly between all the jars. Make up any shortfall of liquid by adding back the vinegar, just until the pickles are covered. Cap the jars. Turn them over and over a few times in the next three or four days to disperse and dissolve any sugar that gathers on the bottom. Chill the pickles well before serving. PS Those clever farmers at the Greenmarket had a Seven Day Pickle with Jalapeno. I think the rounds of chile would be amazing, so will definitely try that next year. Sweet, acidic and spicy? Be still my heart. Oh yes. Adding these babies to the list of things to try in the next few weeks! Linda, would you share that recipe? Sounds like one I’ve been suching for and haven’t been able to find. Combine 6 c. lime (the powdery stuff you put on your garden), 2 gal of water and 7 lb of sliced cukes (if you have a wavy cutter, use it on the cukes); let stand 24 hours, stirring occasionally. Drain, rinse and soak in cold water for 3 hours. Combine 2 qts white vinegar, 10 c sugar, 1 t celery seed, 1/2 t whole cloves, 1 t pickling spice, 1 T kosher salt and a lot of green food coloring – these pickles are Christmas green! Pour this mix over the cukes and boil for 35 minutes. Pack into hot jars and process for 10 minutes in boiling water bath. Makes 6-7 pints. I have been trying to find this recipe for a long time. My Dad used to make these whe I was little. He died very young, and the recipe was not written down . What do you call this recipe? Hi Barbara, they’re called seven day sweets! Ahh secrect recipes. Brings to mind Kung Foo panda… the secret to the recipe? The secret to the recipe is there is no secret! I encourage people to SHARE their recipes, tell your story, Honor the source of the recipe, tell their story. On another note, instead of slicing into a bowl I use a rectangular plastic storage container that is just wide enough for my mandolin. Then Im not trying to fling a bowl around my kitchen. 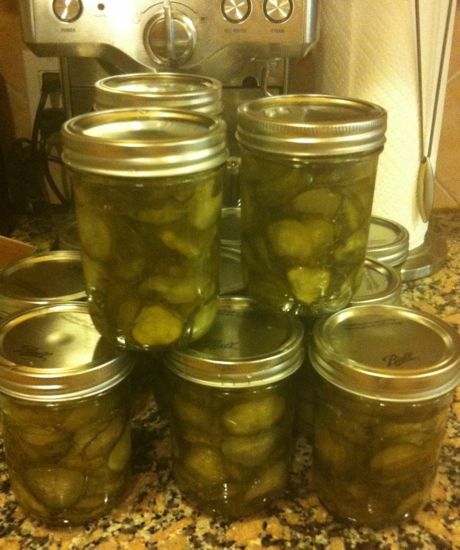 I have a recipe that is very similar but they’re called Vera’s Seven Day Pickles. A “canning” friend told me that grape leaves may be used instead of alum; indeed, I invited her over to pick as many grape leaves as she wanted. Since that day long ago, I’ve always put them in with my dill and sweet pickles and it works. I also read that removing the blossom end of the cucumber removes the enzymes that cause pickles to soften. Because I have an abundance of grape leaves, they do the trick for me. It’s probably difficult to imagine, but on July 4th we finally had a temperature of 70F, something we haven’t had since last summer. It will be a while before I have any pickling cucumbers! I use grape leaves too. I go into a farmers field and collect wild grap leaves. I believe the crunch enzyme comes from alum or lime or grape leaves and some say oak leaves, so I’m sure all of them work. And Linda, do you think Vera and Luvey knew eachother? That makes me smile!! Always cut the blossom end off your cucumbers before pickling. If you don’t you’ll get mushy pickles for sure, and I blame the blossom ends for the great pickle explosion of 2005. But that’s another story. If you don’t know which is blossom and which end isn’t, just cut them both off and stop fretting! It is the tannin in the grape leaves so oak should work as well. I’ve used grape, planted them so I had the leaves, but not oak. How many grape leaves per pint? I have never made pickles but will be trying these! One question; am I correct in assuming there is no need to place under refrigeration up to where you say to chill before serving? Love your site! You have encouraged me to try many new things, thank you. That’s right – no refrigeration necessary! Super, thanks. I made your raspberry violette jam but used St. Germain. So yummy! I assume is ok to use a metal bowl for the sugar step. It appears there is no need for this question because of the pictures, but just wanted to make sure. Honestly? I don’t have a bowl big enough, so that’s what I use. I wish it was glass or ceramic. Cathy: thank you so much for posting this! I can’t wait to try these as I am fairly addicted to all things pickled. I can’t see alum without thinking of those old Warner Brothers cartoons in which Wyle E. Coyote’s head shrinks after eating it. I know. It seems crazy, but I’ve been eating these for over half a century (good golly!!) and I’m still here. Once I pour the hot liquid in the jar with the pickle, add the lid and screw top and I turn the jars upside down. This heats the lid. After 10 minutes invert the jars lid up. As they cool you will hear them pop as they seal. If any don’t seal you can do a water bath to seal it. 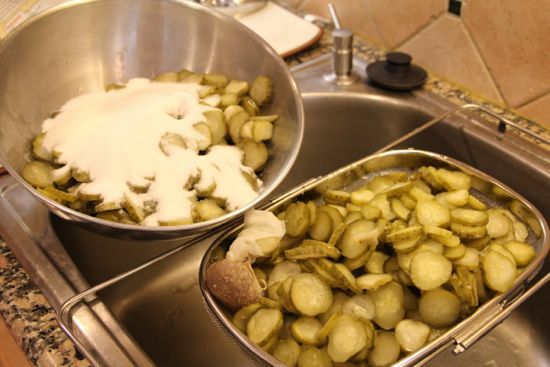 The recipe does not say anything about pouring hot vinegar on the pickles and it is a major variation from the recipe to put them through a water bath. I am pretty sure they are not supposed to seal. my recipe for sweet pickles turns into about 14 days. they sit in brine for 7 days so some call it 7 day but then a day in hot water, a day in alum water and 4 days of hot vinegar sugar pour over…same syrup, just reheated. I use a crock, and when done it can sit in the open crock if you want which is what a lot of the old timers did. I put mine in jars, pour the hot liquid over. and put lids on. they usually seal, but if not, just eat them first…they will not spoil…I have yet to find anyone who has any as good as these. got it from a sweet lady who was my sister-in-law’s (who is in her eighties) mother….so it is an early 1900-s recipe and probably before the convenience of most of our home canning methods. gotta share….my sister-in-law once had some while at a family pot luck and started looking for who had brought them…because they were “like my mother’s” when she asked me…I told her of course they did because they were from her mother’s recipe. She was very please another generation were enjoying them. I lost my recipe that I have had for 40 years. But I remember they sat in brine for 7 days, then I used the alum and vinegar. 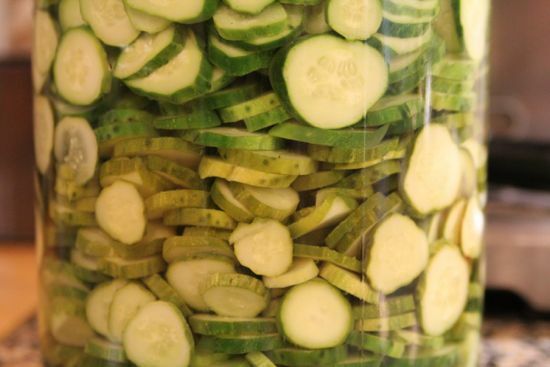 When I packed them in jars, I used layers of cucumber and sugar. Your recipe seems the closest to mine. could you send it to my email address. Thank you very much! I miss having canning stock and maybe I don’t have to. Not having to process is perfect! Do you have a recipe for kosher pickles that aren’t processed? I used to make them but never liked them as much as the Clausen ones that are in the deli case that are so crisp. At last, the pickle recipe I have been searching for…I’m all over this one, Cathy. Love the idea and it is almost cucumber season here. Never made anything but dill. Mom used to make so many kinds: bread and butter, mustard, mixed pickles, you name it. This sounds like a lot of fun and too good to not try. I can’t wait to finish painting my kitchen and go get some cucumbers to make these. I LOVE pickles! And love making them even more. Thanks! Is there a particular type of cucumber you recommend for this recipe -pickling cuke, Persian or slicing? Thanks, Cathy, I’m really looking forward to trying these! I usually choose pickling or kirby cucumbers, but I’ve made it with all sorts. Could not resist! Day 1 done. This is by far the most laid back recipe ever. Love it. Cannot wait to taste the results. First time using alum. Wondering if I could add some garlic cloves, or is that not a good idea due to lack of processing? Yay! So glad! Regarding the garlic, I think you’ll see, once you taste this pickle, that garlic isn’t part of the flavor profile. Additionally, garlic is one of those “chance of botulism” additions to any canned item. While there is probably enough vinegar to make it safe, I would be afraid since there’s no processing involved. That’s what I was kind of thinking. I’ll save the garlic for the refrigerator garlic dills. I am so looking forward to Day 8! My husband and I just devoured the first jar last night. Perfect compliment to the spicy Coppa. Really wishing I opted for the full 10#. Thank you so much! This is def. going into my regular pickle rotation. May even need to make another batch next weekend, as friends are asking for jars! If I have only 2 lbs of pickles, is every step the same as far as the amounts, except for the sugar step at the end? Thanks. Can’t wait to taste these. Hi, my guess is you will need only about a quart of liquid to cover two pounds of slices – so cut the salt, alum and pickling spice back to 25% of the recipe measure shown. The jar you are intially fermenting these in, is it sealed, just covered or does it not matter? Hi Eric, The jar has a rubber gasket that seals it, but I’ve also made these in a giant flower vase (no kidding) with plastic wrap and a giant rubber band on the top. vase fermeted pickles… what a lovely Bouquet! Hi Cathy, I have been reading your blog for years, and I have been making these pickles since you posted about them the first time back in 2010. These pickles are absolutely fabulous! I hope you don’t mind, but I posted about them on my blog so that I would have my own record of them. Of course, I linked back several times to your wonderful posts and encouraged people to check them out for themselves. Thank you for posting about these several years ago and now! Welcome to the pickle club! I’m delighted you made them and posted about them. Clearly, it’s a recipe that needs to be passed around, right? My Mother always made pickles but her recipe was from heart and altho I always helped her I was given certain tasks so I never got to know the whole recipe. When I first got married and had kids, we would go to the market and buy the small pickles and I would make them. Half-Sours were the only way we ate them and whole is how we pickled them. So thrilled to try these! Two questions: my family prefers their pickles in spear form. Will that work? I’m guessing it would as you mentioned chunks, but still new enough to be unsure if altering the slice shape changes the chemistry or volume in some way. Also, I only have five pounds of cukes. Should I halve everything in the recipe, or use the recipe as stated understanding there will be leftover liquid? I’ve never made these as spears, so will be curious to hear how it works. Halve everything for half the weight of cucumbers. It will work out fine, but you’ll be wishing you made 10 pounds. !!! Ha! 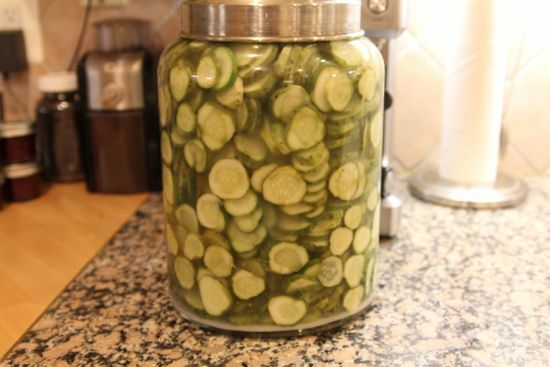 I want to make these pickles this week but wonder if it is ok to use aluminum pans as I do not have anything else large enough for 10 pounds of cukes. Will this cause a reaction with the cider vinegar? Aluminum will react with the vinegar. You’re best using glass or ceramic. I’ve found huge glass containers at Marshalls and World Market and lots of secondhand shops and garage sales. You can seal it with plastic wrap, but getting a container with a lid is better. Enamel is non-reactive, so that would be okay! Can’t wait to make these (finally) this week. Cathy, have you ever waited longer than three days between day 4 and day 7’s activities? I just finished day one, and realized I will be out of town on Day 7, meaning it will be Day 9 before I finished and bottle these pickles. Any idea if it’s ok to let them sit longer in the vinegar? I can’t imagine it would matter, Molly. The last step just finishes the flavor, not the pickling part. I think they could sit in the pickle brine for awhile. Wow! Talk about a speedy reply! Thanks Cathy! Looking forward to seeing how these turn out. I’m making your giardiniera too right now, which is amazing! Just trying these today and realized that the only non-reactive container large enough to put all these pickles is my water bath canner! Obviously the lid isn’t going to form a tight seal. Is that important? a tight seal isn’t urgent… enjoy the pickles! So glad to have found you! What a treasure trove of classic and delicious! As an aside, alum also should be an ingredient in your medicine cabinet – make a paste with water and it takes the sting and swelling out of bug bites and stings , and works wonders for canker sores…. I started making the pickles yesterday! Can’t wait! That’s great info re: alum. I’ve used a similar paste from baking soda and water for bee stings, but didn’t know alum would do the same thing. Enjoy your pickles! Alum is also supposed to stop small cuts from bleeding, such as from shaving but have been too chicken to try it out. If you were going to add jalapeno would you just pierce it and add it whole like the lacto fermented pickles? And at which stage would you add it? I’m making my shopping list as I read the recipe..what fun! Do you think this would work with zucchini and yellow sqash? I won the battle against the squash beetle for once this year and have a bit of a glut! Thanks for all you share. Mary Lee, I have no idea, but would love to know how they turn out! Please come back and tell us. As far as a squash pickle recipe, it’s alot easier to keep squash and zucchini crisp than a cucumber. I have a great, simple recipe for squash pickles that takes just a couple of hours and turns out great. Cucumber pickles are worth the extra time, though. Mrs. W., I am into my second season of canning and loving it more than ever!! I think in part it is because my favorite shopping is in the produce section of the supermarket & our local farmers’ market. Second, I may be part rabbit 🙂 I love this recipe! It turns out PERFECT every time! Right – down to the number of pints it will produce. Just finished my first 12 pints for 2013. I will be making more. I have a friend who literally opened a can I gave her and consumed the contents in one sitting. She loves, loves pickles – as I do. She is the friend I mentioned who had her husband (a farmer) put in a pickling cucumber patch on their farm as a birthday present for me. I am so excited. Can this recipe be applied to other vegetables do you think? I love your blog!! Hi Pam. I can eat an entire jar of these pickles in one sitting ,too. They are so addictive! I’m glad you like it. I haven’t tried any other veg, but think it might work well with jalapenos! Fabulous pickles! I have made these a couple of times and get raves. I do keep adding sugar till they are well covered. They are even better after they sit for several months. I pull out a jar and put it in the fridge. They are much better chilled. I also make these in a ceramic crock rather than a glass jar and it works great. I am sooo excited! Day 7 of pickle process and I just finished the sugar step. I don’t have enough liquid and I only saved 2 cups of the cider vinegar. What should I do? I had the same problem so I just made up a little more solution if vinegar, sugar and pickling spices and simmered that a while to impart the flavors. Let that cool and then topped off the jars as needed. I used a lot more sugar than vinegar. But before you do this, give them time in the jars with the sugar. They keep making liquid for a while. You can add more sugar to the jars too before you add the extra vinegar/sugar solution. Give that a chance first. We like ours really sweet so theses turned out fabulous. They also get better with age. They mellow out. Can I make these with chuncks? I started making these 7 day pickles 3 days ago. I was busy canning some tomatoes last night and should have drained them for the first time but forgot till today. Will they be okay do you think? Also, am I correct in assuming that no salt is added till the second batch of hot water on day 2? I don’t see it in the recipe but just making sure it didn’t get left out. Thanks for the recipe! I made a half batch of these, but did not have enough liquid to fill my jars to the top. Is that ok? Thanks. So,I made these last week….let them sit in the brine an extra day as my time was tight…tasted them and they have a sharp vinegar taste…too much for my liking so I’m thinking the extra day was a mistake. Is there a dill pickle like this one? I need some help? The easiest dill-style pickle is the lacto-fermented pickle (see the post “pickles and frickles”). This is the famous Craven County Sweet Pickle recipe. This is the second year I’ve made them. Interesting! I’ve never heard of Craven County pickles before, but it is the same recipe! I’ve seen them in Mennonite community stores, at the Union Square Greenmarket and other places, and my friend Emily’s family has a 14 day version. It’s a familiar recipe that has been around forever! Thank you for sharing this! I received a WONDERFUL 7-day pickle recipe from a dear friend of mine (her mother’s recipe), but the directions as far as sealing/packing weren’t terribly clear. I’m sure I won’t have enough liquid to go into all the jars, so I will add in extra vinegar (her recipe didn’t specify white or cider vinegar so I used white, but I’ll bet cider would be delish). Also nice to know that they don’t have to be water-bath canned, as they are wonderfully crispy now, and I’d hate to lose that. Again, thanks! I’m in mid-Tennessee, and I’m going to try planting some cukes again since mine didn’t do so well the first time (I planted them way too close together). If they come out well, I’m definitely going to try your version. I made these pickles about 3 weeks ago and they disappeared in record time. Everyone loved them (including me). I just finished another 20 pound batch yesterday and my husband planted more cucumber plants. These are my new addiction!! I did end up adding quite a bit more sugar to get the syrup and used pickle crisp in lieu of alum (couldn’t find the alum). Thank you for sharing the recipe. I’m on day 3- subbed a bunch of grape leaves for the alum per my mom’s suggestion. It’s been very hot and humid here and the pickles are in a pot with a lid, not sealed tight. They smell a little funky and are cloudy at this point. Is that normal? Yes, that’s ok. They will smell a little fermented! You’re about to put them in the vinegar and that’s going to change everything. Hi Terry, I’ve added whole jalapenos and sliced jalapeno – both will work (slicing the peppers allows you to remove the seeds for a little less heat!) Add them with the vinegar. How do you seal these for the shelf? I didn’t see where anything was hot when you can them to make them seal. So excited to try these! Did you ever find out how to seal them for shelf life? I am not sure what to do either. You don’t need to do anything to firm seal them. You poured boiling liquid on them several times during the process. Plus with all the sugar and vinegar in them, nothing bad can survive. I’ve made these for years and eaten them years later and they were fine. Process pints in a boiling water bath for 5 minutes. 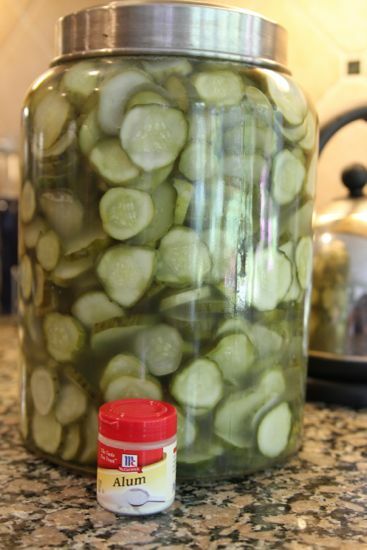 I have never made pickles, so giving this recipe a try! Can’t wait! The question I have is do I leave the bundle of spices in the jar with the vinegar all three days? Thanks for a response! Yes! Leave the bundle of spices in the jar for all three days. Made these and they are crisp, but a real vinegar bite. They have been in jars for a day and a half. Can I add more sugar at this point to increase sweetness? Hi Ron, The pickles will mellow in time, but if you want to add more sugar, feel free! Yes…I add a LOT more sugar than recipe states and everyone begs me for these. I just keep adding sugar, shaking and turning upside down until it is a pretty thick syrup. Otherwise, they are too tangy for us. We like our sweet pickles really sweet. To each his own though. Just finished making these but I didn’t have nearly enough juice to fill the jars, so I just boiled some more vinegar and sugar until I had enough. I reserved about a quart of the vinegar from the batch, so I assume next time I’ll have to save all of the vinegar and then I should have enough. Can’t wait to try these! I know this may sound stupid but is it store bought pickling spices or do you have a recipe for picking spices? There’s a recipe in my book and also on the blog here. Just search for pickling spice. Hmm. They do sound good and are very similar to my silverskin onion pickles but they use salt not alum. Not that I’m fearmongering but it does irk me a little when people assume ‘natural’ means ‘harmless’ so I should point out that aluminum (it’s the alum) consumption has been linked to certain types of Alzeimers. Just saying. I am new to pickling, but this recipe is so close to my Mom’s recipe that I want to try it! Sadly, never took the time to learn her canning techniques before she passed. If I could only go back now…. Questions: do I cut the blossom end prior to day one and the beginning of the soak cycle? Where do I find grape leaves!!? How long should the pickles sit and rest before eating? When you say overnight how many hours do you suggest? I have started the recipe and first two day at least 12 hours. When you drain do you reuse what was drained and keep adding to it? Discard the liquids drained off the pickles until the end — the vinegar and sugar mixture will be reused. Hey there! I’m on day two – on day 3 do you boil the water with the alum. I assume no, but the other days it’s boiling, so I just want to be sure! Thanks! Yes use boiling water to dissolve the alum. Thanks! I see it there now. Did u add it? Or am I just losing it?! Which is a possibility! 🙂 So excited to try these! Hi Jennifer. The sugar is added in the book at a different time than here, but it’s still added! Follow the instructions in the book — that recipe has been tested and perfected. Hope you love them! This may be a stupid question but does 10# mean 10 cucumbers or 10 pounds of cucumbers. Thanks. Hey Cathy! I love that you used a mandolin slicer. Do you know where you can get one of these? Would online be the best option? Thanks for your recipe! Hi Billy, I use the OXO brand mandoline. It’s really solid and about as safe as a mandoline can be. 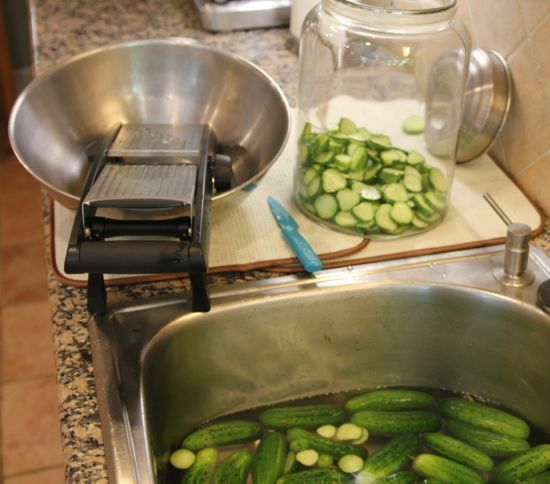 If you don’t want to go all the way with a mandoline, a ruffle slicer is inexpensive and makes a pretty pickle. Do you know, can I use Alum in other veggies, such as asparagus and carrots? Can you use regular white vinegar or does it have to be apple cider vinegar? The apple cider vinegar provides a very nice sweet and sour flavor to the pickle. I would not make this pickle with white vinegar. I have been making these pickles and putting them in mason jars and using a ring and seal on top. I’m wondering if I could use a plastic screw-on lid instead as they are less expensive. They aren’t sealed either way. Any comments? And can they still be stored for a long period of time that way? I don’t have a definitive answer for you. I can only say that it makes me a little squeamish to think of that plastic in contact (or close proximity) to the food. Question I made these and put them in the jars. The lids did not “pop” and seal like water bath is that ok it shod I run them thru the water bath processing to have them seal. These pickles do not have to seal to be shelf stable. If you want to seal them, use a boiling water bath for no more than 5 minutes. Do you place the pickling spice in the app,e cider vinegar as it is boiling. Or after? Boil the cider vinegar with the pickling spice. Day 2 I left them in the water 36 hours and they smelled and felt a bit slimy…..I did a slight rinse and put the alum in and it’s been about 12 hours…..did I ruin them? I had to divide into 2 ….I had one pot and I used a crock pot with lids sealed down. This makes me nervous and I wonder if I should cut the alum short and get it moving along. I think you’l lbe fine. Do not cut down the time with the alum – that’s what makes them crisp. Hi Mary, they do not need to seal. Just place the lid and tighten the ring. What size jar did you use for this process? Better yet, do you have a link for where I can get one like that shown in your pics? I used a 5 gallon lidded jar. I know I’ve seen them at World Market and Target. Thank you so much! I got a jar of these as a door prize at a native plant society meeting in Sept. They are amazing! I’ve made bread & butters, and dills in all shapes, but never 7 day pickles. Can’t wait until next summer to put up a mess of these! I have a 5 gal lidded jar that will be perfect! Again, thanks! So glad you like them! I can’t go a season without making at least one batch.